Bottles filled with MaHaLo Hawaii Deep Sea Water passed by light boxes as workers inspected the bottles for imperfections at the company's plant near Kailua Kona in late September. KAILUA-KONA, Hawaii » Known for its $30-a-pound Kona coffee beans, posh $1,000-a-night hotel suites and $1 million ocean-view condos, the Big Island's west coast is now cashing in with another pricey offering: $6 bottled water from the bottom of the ocean. Desalinated deep-sea water from Kona is the state's fastest-growing export with demand soaring in Japan. Super-cold water sucked up from thousands of feet below the Pacific Ocean's surface is being marketed as healthy, pure, mineral-rich drinking water. Koyo USA Corp. already is producing more than 200,000 bottles a day and says it can't keep up with demand in Japan, where it sells 1.5 liter bottles of its MaHaLo brand for $4 to $6 each. "We couldn't ask for better sales," spokesman John Frosted said. "At this point, we can't make enough. We have no surplus." Four other companies are hoping to cash in on the deep-sea water craze, and so is the state, which collects royalties and rent from the bottlers based at the state Natural Energy Laboratory of Hawaii Authority (NELHA) property next to the Big Island's Kona International Airport. The state pumps the chilly water from 2,000 feet beneath the sea, and the companies pay a few cents per bottle to use the official NELHA logo on their label, certifying the deep-sea water was collected at the state facility. Koyo, the only company currently selling the deep-sea water from Hawaii, is expanding its plant and has applied to sell the water in the United States. It will sell for much less than in Japan. In addition to Koyo, Asia's thirst for Hawaiian seawater also has attracted Los Angeles-based Deep Sea Water International; Japanese-owned Enzamin USA; Korean-owned Savers Holdings Ltd.; and Japanese-owned Hawaii Deep Marine Inc. Known for its $30-a-pound Kona coffee beans and luxurious $20-a-pound chocolate-dipped cookies, Hawaii's Big Island is now cashing in with another pricey product: $6 bottled water from the ocean. Lab supervisor and Koyo USA spokesman John Frostad displayed a 1.5 liter bottle of drinking water produced at the company's plant near Kailua Kona earlier this month. The companies, on the 870-acre NELHA site, spent a combined $65 million turning black lava fields into parking lots and factories in 2003. This year, they are investing another $85 million to $100 million. Besides the startup costs and the expensive desalination process, the companies will spend millions on shipping tons of water to Asia. "Why Hawaii and pay so much transportation? 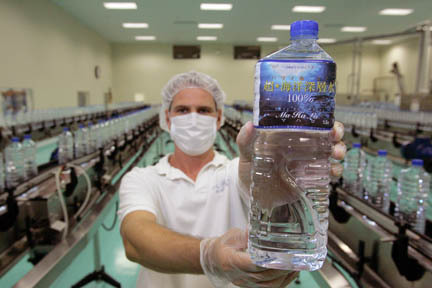 Because Hawaiian water is best," said Yoshiyuki Furuno, general manager of Enzamin USA. He said Hawaiian products have strong brand recognition in Japan for being high-quality, natural and pure. "Japanese people have a very good image of Hawaii as a beautiful place with azure skies, clear seas and gentle breeze," he said. "They have a very good image for Hawaii." Savers General Manager Guy Toyama said bottled sea water has been around in Japan since the mid-1990s but the Japanese product cannot match the depth, quality and purity of the water from the middle of the Pacific. Savers plans to begin construction this month and will sell primarily in South Korea before expanding to China and the United States. Its 2-liter bottles will retail for about $4 and half-liter bottles for about $2. The company will desalinate its water using reverse osmosis and electrolysis and produce as many as 12 million bottles a year. Toyama acknowledges that competition with five bottlers in Kona will be fierce, since they are all targeting Asia. However, he hopes they will work together to market Kona water worldwide. The state pumps the water using two pipes that go down 2,000 feet and then transports it to the companies, which do the desalination, filtering, bottling and packaging. The state will soon complete construction of a new 55-inch pipe that goes 3,000 feet deep. Koyo claims deep-sea water contains ionized sodium, ionized chlorine, magnesium and calcium, which can help with everything from circulation to metabolism. The depth also protects the water from modern contaminants from industry, farming or humans, the company said on its Web site. Koyo's 100,000-square-foot facility features a windowless factory filled with modern stainless-steel machinery, conveyer belts and pipes. Most of the process is automated and runs 17 hours a day. Light-blue plastic bottles are blown and stacked by a robotic arm before being rinsed, filled, capped and labeled. 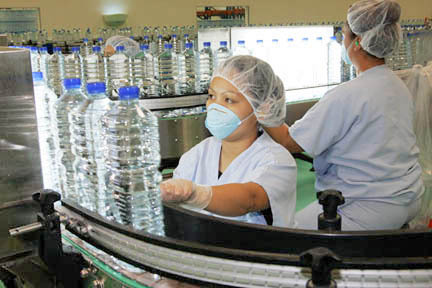 The bottles are taken to a large room where employees wearing face masks and hair nets inspect them for loose caps, misplaced labels or damaged bottles. "This is a sterile, phenomenally modern, robotic, well-run place," said former NELHA Executive Director Jeff Smith, who was interviewed just before he left NELHA last month. "It looks like a hospital, it's so clean." When Smith was first approached three years ago by a company that wanted to bottle and sell ocean water, he thought it was a joke. Now, government and business leaders from around the world have visited NELHA to study the deep-sea-water-bottling phenomenon. Smith said he realized there was a need for clean drinking water, especially with the world's expanding population and fresh water sources being polluted by industry or humans. "Many people have said, 'Hey Jeff, that's a fad.' I'm thinking, so was the car," he said. "People need water." Smith, who has left NELHA to work for Deep Sea Water International, said the bottlers diversify Hawaii's tourism-depen- dent economy. "No matter what the tourism industry does, these guys will keep running," Smith said. Mark Anderson of the state's Foreign-Trade Zone Division said Hawaii always had difficulty creating new export industries because Asia and the West Coast have more resources and cheaper labor. But Hawaii may have discovered an inexhaustible gold mine. "There's a lot of water out there. I don't think they're going to run out," Anderson said.